I have always loved scones more than any other pastry ever. Let’s just say I have very high standards for scones. Travelling the world I seeked the very best scones in LA, Paris, NYC, SFO and I also made hundreds literally. So drum roll please for Ovenly who nailed the perfect balance of elements and created the original recipe which I happily adapted in my test kitchen. Many years ago in one of my first interviews, I was asked if you were a pastry which would you be? I immediately said a scone. Perhaps its my English background (My Mom was born in England) and I went to a British school in Mexico City. But I also love the texture, the perfect balance of sweet and salty and the biscuit feel to a scone, in my travels that is my dream breakfast with the best barista coffee… I melt just savoring the moment. Preheat convection oven to 425 F.
Prepare a baking tray (I use perforated trays) with silpats. Cut the butter into ¼- to ½-inch cubes and freeze for 10 minutes before using. I suggest 2 methods: the first is very time consuming and not my favorite..
Whisk together the flour, coconut sugar, baking powder and salt in a large bowl. Using a large fork or a wooden spoon, mix the currants, apricots and rosemary into the flour-butter mixture. Stir the cream into the flour-butter mixture with a large wooden spoon or a fork until the dough begins to come together. The flour should not be fully incorporated at this point, and do not over mix. Transfer the dough and any loose floury bits to a floured counter top or pastry board/mat. Quickly “knead” the dough until it comes fully together, and then flatten it with the palms of your hands into a ¾ inch-thick mound (the shape does not matter at this point). Fold the dough in half, give it a quarter turn and then flatten it again. Repeat this process 3 more times. Flour your surface once more, and then shape the dough into a ¾ inch-thick round that is 6 inches in diameter. Use a bench scraper or a knife to cut the dough into 4 equal triangles. Then cut those in half to make 8 even triangles. Place the triangles on an un greased rimmed sheet pan. during baking. If baking right away, brush with cream and top with coconut sugar to finish; or if freezing, brush with cream and top with coconut sugar just before baking. Bake for 18 to 20 minutes, (you may need to lower the oven temperature to 400 F half way through baking) or until the tops are golden brown and a toothpick inserted in the center of the scones comes out clean. Cool the scones on a wire rack. Serve warm. Put flour, baking powder, salt, coconut sugar and rosemary in a food processor or Thermomix: add the butter and process until the butter resembles lentils. Transfer mixture to a bowl and add the fruit, cream and mix with a spatula until the dough is soft and uniform. Quickly “knead” the dough (just to stick the dough but not kneading as in bread baking) until it comes fully together, and then flatten it with the palms of your hands into a ¾ inch-thick mound (the shape does not matter at this point). Fold the dough in half, give it a quarter turn and then flatten it again. Repeat this process 3 more times. Flour your surface once more, and then shape the dough into a ¾ inch-thick round that is 6 inches in diameter. Use a bench scraper or a knife to cut the dough into 4 equal triangles. Then cut those in half to make 8 even triangles. Place the triangles on an ungreased rimmed sheet pan. These scones (and all) taste better the same day, but will keep well for 2 days max in a plastic container (I love recycling salad containers). If you are diabetic or limiting sugar: I recommend you use nuts instead of dried fruit or even use a high percent chocolate 75-85 % chopped. Hey Buddy!, I found this information for you: "NOBLE APRICOT ROSEMARY CURRANT SCONES". 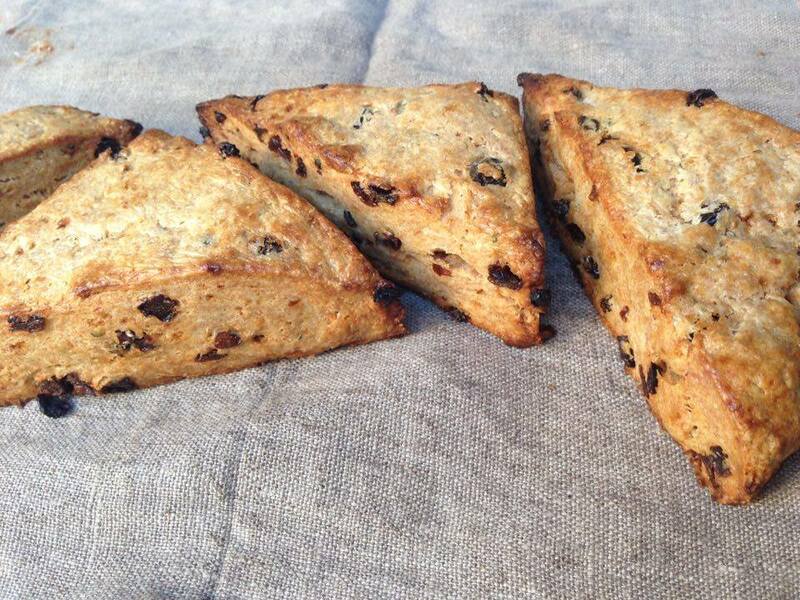 Here is the website link: https://www.vanessamusi.com/noble-apricot-rosemary-currant-scones/. Thank you.